This world is full of famous people and those who have met them. As a newspaper reporter, it’s not unusual that I should have rubbed elbows with a few famous and infamous folks. What is unusual is that it happened to me at all, considering my ragged beginnings as an orphaned child, born out of wedlock, placed in a foster home and eventually adopted by soul-crushing parents. I grew up being constantly punished, made to believe that I deserved constant punishment, told repeatedly how inadequate I was as a human being. It’s not surprising that I grew up expecting rejection from the world at large, considering what a failure I was in my parents' eyes. I entered the tumult of adolescence with a serious inferiority complex, taking refuge in music, in playing the guitar. I was lucky enough to have steady gigs as the years went by, content to be in the background. And in my early twenties, smoking marijuana provided another refuge. It was only when my wife became pregnant with our first son did the inner adult begin to emerge. I had been hiding from the world, extending my adolescence, just talented enough to have gigs but not talented enough to have an actual career in music. Imagining what kind of father I would make in my current condition, I belatedly realized it was time to grow up. I returned to college, earned a journalism degree and began a new career for which I was not only trained extensively, but one in which I could actually excel. Reporter Russ Loar meets presidential candidate Bill Clinton in 1992. 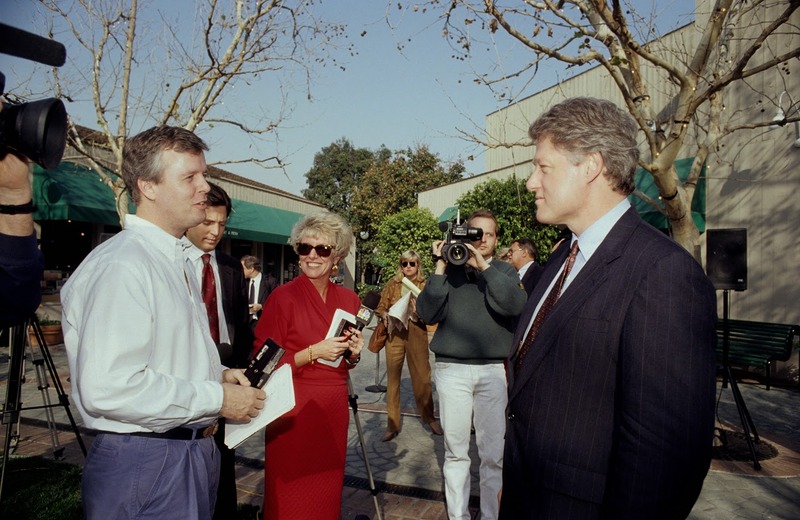 Thus began the journey from a frightened little boy who would hide under the bed whenever the doorbell rang, to an intrepid newspaper reporter who would one day meet the man who would become one of the most popular presidents of the most powerful country on earth–Bill Clinton. Meeting famous people is a routine fact of everyday life for many journalists, especially those on television who have their own star power. But I was a 36-year-old college graduate with only an internship and a year at a public relations firm writing newsletters when I got my first newspaper reporting job at a small weekly paper. It was not only the journey from being a dope-smoking, introverted guitar player that was remarkable, but also a combination of luck and the ambition to seize opportunity that led to my memorable encounters. Here I was, the boy who was brought up to believe he was among the least capable human beings on the planet, interviewing some of the most brilliant and accomplished people on the planet, writing stories about them for thousands of readers. For those reading these essays about my life who are not members of my family, I don’t expect you to be that interested. This world is full of famous people, and of course it’s far more interesting to be a famous person than to be a person who has met a famous person. But I am writing these essays for my family—my sons, my daughters, and perhaps someday grandchildren and their progeny. I have had an improbable, lucky life, and even at my advanced age of 65, I continue to have ambitions. I am writing these essays so that my succeeding generations will know where they came from, for I am the beginning of what I hope will be a long line of family. I was born out of wedlock by a father who already had a family and a mother who gave me away, perhaps out of concern for my well-being, perhaps not. They are the accidents from which I was created. I am the beginning of this family tree, married to my dear wife Cheryl for decades now, a loving mother who is highly literate and intelligent with a sophisticated appreciation for the aesthetics of this life. So to all those who follow, whether by way of family or in spirit, I write these essays for you. I write them to let you know who I am, or perhaps by the time you read this, who I was.